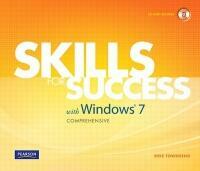 KEY BENEFIT: Skills for Success is the Microsoft Windows 7 textbook that recognizes how people learn today! Skills are taught with numbered steps and bulleted text so readers are less likely to skip valuable information. KEY TOPICS: Exploring the desktop; opening programs and using the Start menu; creating a new folder; copying and moving files; renaming and deleting files and folders; resizing, moving, and scrolling windows; capturing and saving an image on screen; and more. MARKET: For those looking for aguide to computing concepts and skills, in particular Windows 7 and Office applications, that recognizes how people learn today-with numbered steps and bulleted text.